The Jungheinrich EJE i20 stainless steel pallet truck combines the advantages of a stainless steel frame with proven Jungheinrich drive and control technology. The truck is designed for demanding transport operations up to 2000 kg. The EJE i20 is best suited for operation in corrosive and damp environments and satisfies the most stringent hygienic regulations. With these specifications, the truck is ideal for use in the food, chemical and pharmaceutical industries. High-quality V2A stainless steel also offers an abrasion-resistant and smooth surface, even with intensive use: This prevents dirt deposits, thus preventing the spread of germs and bacteria. The rugged vehicle design is designed to withstand regular high-pressure cleaning and disinfection. Water can flow freely over the continuous bevelled surfaces; special seals inhibit the ingress of fluids into the drive compartment. The design of the multifunctional tiller arm uses encapsulated sensor technology (IP 65) that guarantees maximum protection against breakdown. Contact-free electronic rocker switches as well as an easily accessed crawl speed button allow for ergonomically perfect operation with every tiller position. High acceleration, speed and efficient braking are the strengths of the powerful drive motor, achievable by the application of innovative 3-phase AC technology. The centrally driven EJE i20 achieves the necessary cornering stability via the Jungheinrich ProTracLink torsion bar made from high-grade stainless steel. Lateral exchange of the battery further ensures the efficient application of the truck in shift operations. All of the above points add to the efficient, safe and fast handling of goods. Jungheinrich proprietary 3-phase AC motor technology provides increased efficiency and reduced forklift operating costs. Outstanding efficiency due to excellent energy management. Top speed of 3.7 mph with a fully rated load. Quick directional changes without hesitation. No carbon brushes or commutators to replace, resulting in reduced maintenance requirements. 2 year warranty on drive motor. Battery capacities up to 255 Ah provide long forklift operating times. Medium compartment: up to 255 Ah. Optional integrated charger (115 V / 30 A for both flooded and maintenance-free batteries up to 375 Ah) for fast, simple charging at any wall outlet. 3 color LED battery discharge indicator as standard or optional "CanDis" information display with enhanced visual charge indicator, hour-meter and service code display. Optional “CanCode” keypad allows for secure lift truck activation via PIN and includes 3 pre-set travel programs. When combined, CanDis and CanCode allow for quick adjustment of speed, acceleration and motor brake parameters without a laptop. The EJE walkie pallet trucks can be equipped with an optional “ProTracLink” caster wheel system, linked via a cushioned torsion bar, which distributes stabilizing forces dependent on travel conditions (i.e. evenly across all wheels during straight travel; concentrated on the outer support wheel when turning). Clearly marked operator controls and rocker switches, with tactile raise and lower indicators, allow for intuitive operation of the forklift in any handle position. Angled handle head for natural, ergonomic operation. 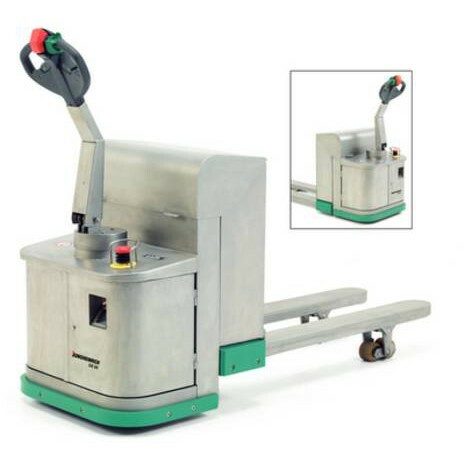 The forklift's crawl-speed button is positioned on the back of the handle head, for quick access and ease of operation when the handle is in the vertical position. The handle head protects against potential failure due to its contactor-less sensor system and IP65-rated dust and moisture protection. 3-phase AC technology ensures significant long-term reduction of lift truck operating costs. Low maintenance, 3-phase AC drive motor with no carbon brushes. Easy access to all forklift components through the one-piece front cover. Sealed forklift controls and plugs are protected from dust and moisture (IP54 rating). Optional “ProTracLink” stability caster wheel system helps reduce potential wheel damage during ramp operations due to its self-leveling adjustment. The torsion bar constantly keeps both support wheels at the same height, reducing the chance of catching or damaging the lower support wheel on the sides of dock plates.